The Summer of 2014 is here. I always had a fondness for winters and winters in Delhi, I have always found mystically beautiful and enchanting. But, those days of pink romance are gone and just as every fantastic dream ends with the stern realities of the day looking at us, the summers are here. Summer stares at us with same intent sternness and a captivating charm of an unpretentious and somewhat religious honest. Mornings are quick to happen and swift in the way they sway from the remnant coldness of the night to the bright warmth of the impending day. The Sun stands throwing fire over a loving earth with all its brutish innocence. It is easy to miss the run unless one is in the habit of getting out of the bed early enough. Runners in the park are rare and those that are there, run with the water bottles, wear cap on the head and a look of solemn, secret repentance on their face- as if they were sinners going through their internal penitentiary out of which they believed they were to come out as Saints. But then, the sweat after any workout carries that sense of absolution. Summer only pronounces it further. The shadows grow longer and suddenly as one tries to park his two-wheeler, one is sorely aware of the havoc we have perpetrated on the nature around us. The immense necessity of a mother’s lap or a father’s embrace is truly understood only when they are long gone. That is the sad truth of life. The shadows, though longer become rarer. Afternoons are longer and remind one of the times gone by. Of ice-cream with more of ice and less of cream, the kulfi with sweetness lined up with secret salt hidden within, the thud of wooden top of the ice-cream box making announcement of the appearance of ice-cream vendor ferrying his goods into the street. We do not have those vendors anymore, they don’t thud the boxes anymore. They do not seem to be much enthusiastic about the work of missionary benevolence which they unknowingly undertake, Santa Clause of the summer, without the paunch and the ensemble. 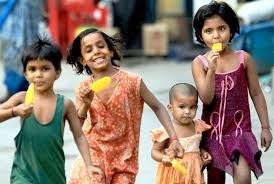 I do not know if kids these days rush to collect the change and make up for the price of ice-candies. They are much more affluent than we were in our times. I do not also know if they like ice-creams as we did. What I do know is that the days are as longer as they were in old times and will leave them with as many memories as they did for us. The pink princess of winter has her own beauty and grace, the silent soldier of summer has his own dignity and honor. The chiseled face of summer, wet in the sweat teaches us the beauty of a blatant truth. The Summer in that coffee house which was like an Oasis in the dust summers of Chattisgarh with the green walls and dark green curtains, hang in my memories of the smoldering summer afternoon when someone reached out and held my sweaty palm, unsteadily holding a cigarette. The wisp of the smoke which rose from those hands wrote a story which sings right now in the voice of a six year old right besides me..Oh, Sweet Summer. There is some wild, unkempt beauty in the harshness of the summer, which hesitatingly stretches its blistered palms and offers us sweet mangoes, watermelons and muskmelons. Summer is the time to be brave, be Spartan, as against the luxurious leitmotif of winters. It is the time to hope for monsoons to come back and break the monotony, for winters to again come back with kinder winds on their pink wings. There is something glorious about the unforgiving splendor of summer Sun, and twenty year later, some people might be writing, "Summer of 2014" just as some one in our days sang - "Summer of 69".